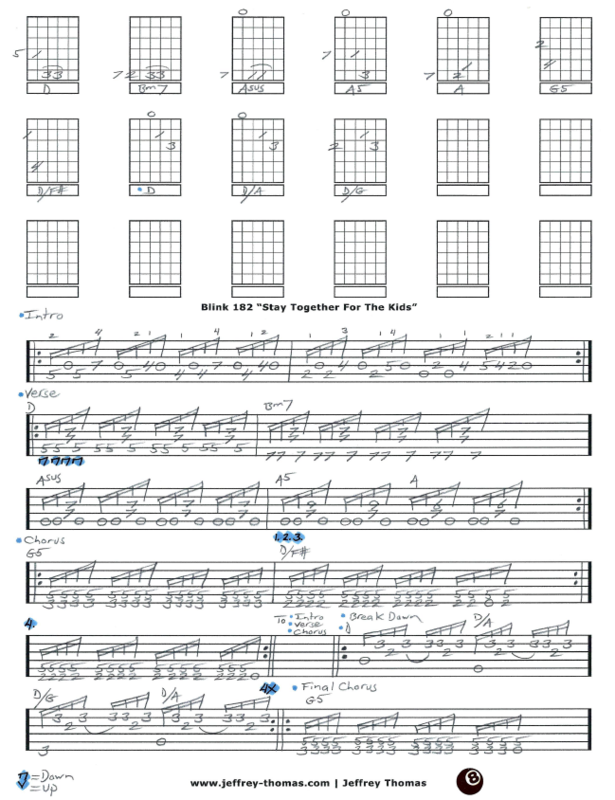 Blink 182 Stay Together For The Kids Free Guitar Tab by Jeffrey Thomas. This custom guitar tab will have you sounding great by combining the multiple guitar tracks into one solid arrangement. Learn all the right chords, picking details and song structure. Stay Together For The Kids is another popular Blink song with my guitar students. Want the full guitar tab for free? Just send in your email on the form provided. Need help playing the song? Fill out the Schedule A Free Lesson form to set up your free Skype guitar lesson today. This song peaked at #7 for Blink on the Modern Rock Chart in 2001. Find more free online guitar tabs on my tab, video and blog pages.